On April 30, 2007 Arnie passed away peacefully in his sleep. 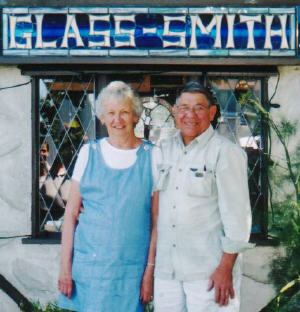 He and Kaye started Glass Smith in 1967 and supported many artists and contributed to keeping the Glass Arts going. He shared his knowledge with anyone that was willing to learn and if you weren't willing, well, he wanted to know why. Throughout the years he has supported many causes especially the environment. He could often be found along the Galloping Goose trail riding his bike. He always knew someone along the way. He enjoyed sharing his herb garden with his friends and customers. Quite often you would find someone walking out of the shop with a handful of flax seeds or a bouquet of fennel and even stinging nettles to make tea with. He was a character, He was one of a kind, He was generous, but most of all, He was loved and we will miss him.